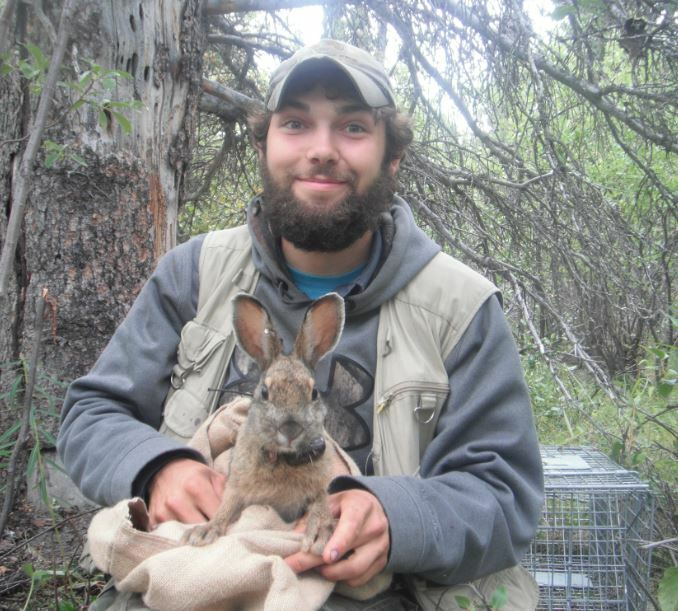 Following an Honours Thesis that focused on parental effects in Great pond snails (Lymnaea stagnalis), my Matsters project will investigate maternal effects in a free ranging population of snowshoe hare (Lepus americanus). Maternal effects can be thought of as cross-generational phenotypic plasticity. Can a snowshoe hare dam influence the phenotype of her leverets in response to predation cues she perceives? The work is undertaken near Kluane Lake, in Canada's Yukon Territory, where snowshoe hare populations exhibit drastic population cycles with peaks occurring every 8-10 years. Here I will expose female snowshoe hares (dams) to an increase in perceived predation risk by running my trusty dog JD through their home ranges. These dams will be compared against a control group who are subject to a non-augmented level of perceived predation risk. Offspring from both groups will be monitored for survival, dispersal, and behaviour. This work will constitute the first test of maternal effects on free-ranging snowshoe hare cycle dynamics, and thereby contribute to our understanding of the mechanisms driving population cycles in a keystone species in the boreal forest ecosystem.